Hiya, well I have been at it again!! 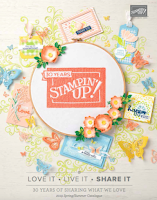 This Vintage style really draws me you know, and is so very easy to achieve with this gorgeous stamp set. Gosh where do I start. 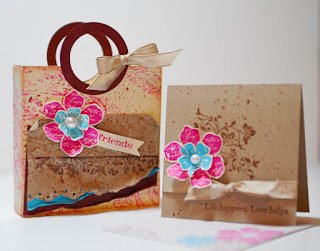 I have torn, crumpled, distressed layered stamps over stamps and splatters let not forget the splatters in fact I am addicted to them LOL. This is a small love noted tote that I designed for one of our Team Training Events in January. So I have revisited this dinky little box but this time I didn't play clean, oh no I went for it. The tote is made in very vanilla and the Very Vintage wheel has been wheeled as a background in Pink Passion. 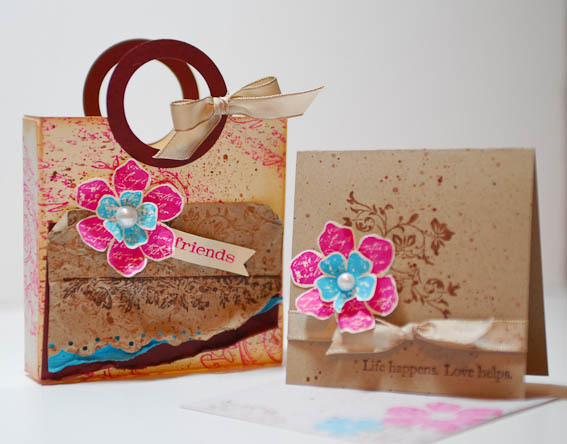 Layers of Bravo Burgundy, Kraft, Tempting Turquoise have been manipulated and crumpled within an inch of their life and then the blooms have been stamped in Pink Passion and Tempting Turquoise. I do love I have to say this is one of my favourites colour combos at the minute. Talking about team training THE PASSIONETTES are meeting on the 25 April for the next Quarterly Team Event. Are you a demonstrator that does not have access to team training sessions are you interested in finding out more about being a demonstrator or would you like to spend a day crafting with like minded people? Then YOU'RE INVITED !! The Event is taking place on Sunday 25th April 2010. Is being organized and run by myself and the lovely Bekka Prideaux. Swapping is part of every team event and this is no different. Swapping (NEW MINI theme) will take part in this time, but you will have the opportunity to swap more throughout the day, please note this is OPTIONAL. The Business topic will be focused on time management. Improving your time management skills can even help you get better results by doing less work, because you're focusing on the things that really matter rather than all the low-priority busywork that just keeps you busy. If you don't learn how to manage your time well, you'll be far less productive than you could be and you'll get a lot less done. You'll also feel much more stressed and overwhelmed, and you'll struggle to find time to spend with the people you care about and to do the things you enjoy. Additionally you will see and create projects suitable for your workshops and classes( we cover new techniques, 3D items, hostess suitable gifts, fancy folds and treat holder type projects). All the materials you need will be provided but you will need to bring along a basic toolkit including a ruler, pencil, paper folder, cutter, wet and dry adhesives, scissors and a hole punch. The price for the event is £26 and along with the training this will cover all the materials you will need on the day plus hall hire etc. Lunch is NOT included in the price so please bring your own, alternatively there is a convenience shop over the road plus lots of pubs that offer food. Refreshments will be provided throughout the day and included in the price. The Event will be opened to all team members and non members, demonstrators and non demonstrators. Everyone will be more than welcome. To book your place please send Paypal payment (as gift preferably) to telemech01@aol.com, payment in full is required by 19 April. Please note that places are limited. If you are having dificulties please send me an email. Hope to see there . We spent a lovely Sunday afternoon drooling over the new mini stuff and she made a couple of cards and made one for me as well, she is so lovely although I did have to ask for it LOL. ps DON'T FORGET TO PLACE YOUR ORDERS BY THE 11 READ THIS POST HERE. 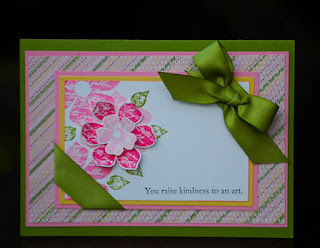 I love the distress look Monica - that little set is gorgeous! I always find turquoise hard to use but your colours here are fab! I think your distressing is fab Monica. What a gorgeous gift set! why do you keep doing this to me?? 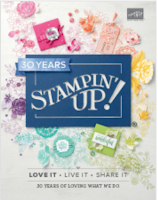 i see the stamps in the catalogue and dont want them - then i see you use them and i NEED them!! !